A Modern Hippie: Better Late then Never...the first challenge! Better Late then Never...the first challenge! It's finally Friday and I love Fridays for many reasons--last work day of the week (well sometimes), relaxing evening at home not thinking about work, wine, excitement of a fun weekend ahead, staying up late, hanging out with B (lots of weeks we have different schedules and don't see much of each other), dreaming of all the fun projects I can start or finish throughout the weekend, and many more. 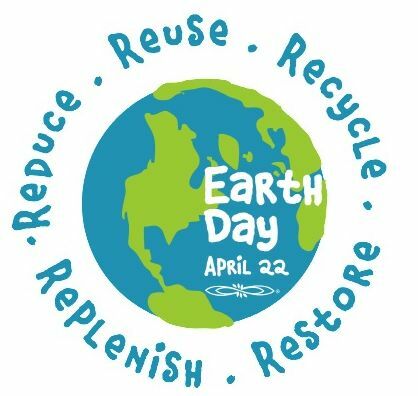 Today is the first Earth Day Challenge! 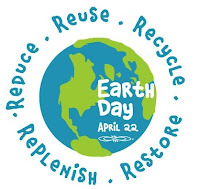 This is how it will work--I will present an Earth Day Challenge everyday between April 1-April 22 (Earth Day). There will be both small challenges we can all easily make and others will take a little more preparation time, but will be well worth it in more ways then one! I will also be offering giveaways throughout the month for those participating in the challenges. Our first challenge will be simple, but first check out this commercial from the 1970's. Trash...I hate seeing people throw out fast food bags, cigarette butts, and other random trash from their car. Are they that lazy to not find a trash can? Seriously...ok, I will step off my soap box! When thinking of trash you probably think of recycling. RECYCLING is our first challenge. For those that do not recycle, I challenge you to start! Most communities offer curbside recycling or a drop off recycling location. Salina offers both, but I opt to do the FREE route and take my things to the drop off location. I keep a reusable shopping bag by our trash can to throw in all of our items to recycle. Since we do not have a garage to store it all in, I keep my full bags in my trunk of my car. Having them in reusable shopping bags also makes it easy to carry into the recycling center. I take our recycling to the center every other Saturday. They take EVERYTHING! Some items are even put out for others to go through and reuse--egg cartons, old books & magazines, etc. Other items are actually recycled. If you don't recycle I encourage you to begin. You will be amazed at the amount of trash you DON'T have when you recycle. For those that do recycle I would love to hear how you keep all your items organized and any tips or tricks you have from your experience. I welcome any questions you may have and look forward to hearing what others are doing.